The biggest challenge in successfully cleaning spiral freezers is trying to reach all the surfaces. Spiral freezers are constructed with minimal clearances, making it hard to use traditional cleaning techniques such as the spraying of liquid chemicals. The interior is too tight to maneuver cleaning equipment properly and operate it effectively. 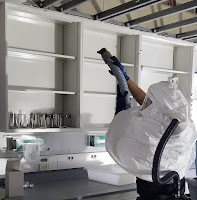 Cleaning every nook and cranny inside of a spiral freezer is a very difficult task when taking into consideration all of the internal components, all of the hard to reach crevices, the difficulty in maintaining the correct contact time of the chemical being used, and the difficulty in the agent reaching all surfaces. Chlorine dioxide gas has been proven effective at eliminating listeria from within spiral and tunnel freezers. ClorDiSys’ chlorine dioxide gas is made using a proprietary generation method and is registered with the US EPA as a sterilant providing a 6-log (99.9999%) reduction of all viruses, bacteria, fungi, molds and spores. As a true gas, chlorine dioxide naturally ﬁlls the spiral freezer evenly and completely, and with a molecule size smaller than the smallest organism, there’s no surface that is safe for pathogens to hide. Gaseous CD is the only decontaminant that penetrates water and decontaminates both the water and the surface beneath, which is important for spiral freezers that typically have condensation issues. One facility which produced frozen sausages had a persistent listeria problem, resulting in consistent positive swabs. After one treatment with chlorine dioxide gas, the facility was able to eclipse 16 weeks without a single positive swab after testing 2-3 times per day. CD gas decontamination has been written into a quarterly preventive maintenance schedule. Attend our Food Facility Decontamination Services webinar on June 7th to learn more or stop by Booth #10 at the North American Food Safety and Quality 2018 on June 5-6th to further discuss.